Juventus stars celebrated with a group meal after knocking Barcelona out of the UEFA champions league on Wednesday night. Juventus defeated Barcelona by 3:0 on goal aggregates after having beaten them at the Juventus stadium by three goals to nil and then playing a goalless draw return leg at the camp nou. Fans had expected Barcelona to perform some magic like they did against Paris Saint German at the same camp nou but Maximilliano Allegri's men refused to be defeated as they didn't even allow Barcelona get a single goal. 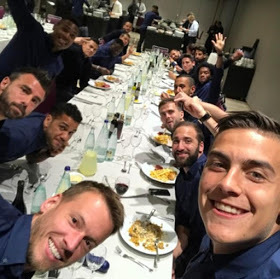 0 Response to "Juventus Stars Celebrate With Group Meal After Victory Against Barcelona(Photos)"